You want your vehicle looking good everywhere you go. After all, a clean and well-maintained car or truck says a whole lot about the person who happens to be driving it. Yet, despite your best efforts, your car suffers a little bit of damage every single day. You may have hit a rather nasty pothole and scraped the underneath of your car or your keys slipped while unlocking the door and you scratched the paint. Perhaps debris flying around on the road or loose gravel got kicked up and hit your windshield, causing cracks and chips. 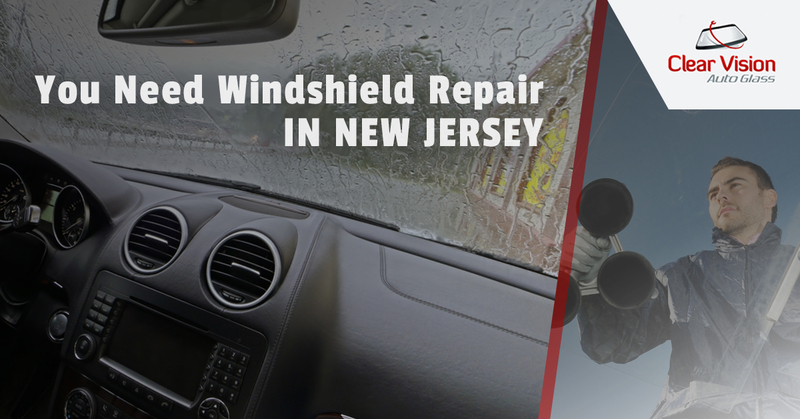 Look, windshield damage happens all of the time, you shouldn’t be surprised that it is the top insurance claim in New Jersey, and the rest of the United States for that matter. All it takes is a small rock impact the size of the dot a pencil makes on a piece of paper to cause damage to your windshield. And while driving on a gravel road will put your windshield in great danger, there are other factors that lead to a damaged windshield in need of windshield repair by Clear Vision. You may have noticed that a lot of windshield cracks have their origins near the edge of the structure, usually about three inches from the end. There are logical reasons for this. Because of the manufacturing process, weak spots occur at these points with more frequency. In addition, the windshield edges take the brunt of stress as this is where they attach to the car. It should also be noted that the large middle part of the windshield is better able to flex and absorb the shocks that happen while zipping down the freeway. This cannot be said about the edges of the windshield as they endure the heaviest of stresses on the road. Variations in temperatures inside of your car and outside of your car can produce small cracks. Think about it: When it’s cold outside, you crank up the heat in your car. While it might be 32 degrees outside, you are sitting in a car that is 75 degrees. In this scenario, the inside layer of your windshield is expanding while the outside layer of your windshield in contracting. In a situation like this, any defect in your windshield can stress and begin to crack. If moisture is involved, the rate at which the crack travels will accelerate. You heard it here first, folks; hail can cause damage to your windshield. A deluge of large hail in the form of rocks can cause extensive damage to your windshield. Hail damage may be infrequent, but the devastation to your window can be great. Just like moisture, dirt can make its way into the inner workings of your windshield and cause damage. The sun is powerful enough to burn your skin and it’s powerful enough to cause damage to your windshield. If the sun beats down on your windshield long enough, it can cause small chips and cracks to become large chips and cracks. Make sure you keep your car in the garage or parked in a shady spot whenever you can. There are things that happen to your car every day that you never give a second thought. For example, you can cause damage to your windshield by driving over a speed bump. You can also do damage to your windshield by slamming your car door. Even jamming on the brakes can cause windshield damage. All of these actions put extra stress on your windshield and any existing cracks or chips that you have will become worse. Just because a chip or a crack in your windshield isn’t in your line of vision at the moment, they will change soon enough as soon as it starts to spread. And don’t think you won’t get a ticket if the crack in your windshield isn’t in your line of vision, it just doesn’t work that way. Besides, a crack in your windshield is dangerous as it can prevent you from seeing the road properly. If you have a cracked windshield or even maybe just a few chips, it is best if your deal with it as soon as possible. Give us a call and we can help.